What began as the "Saal-Schutz" quickly grew out of control as Heinrich Himmler took the band of paramilitary fascist to the next level. True to the Nazi fashion, Himmler decided that it was vital for the socialist movement to have a military force of their own that could parallel that of Germany's standing army. This bold move on the part of a political party quickly brought strife to the organization as they attempted to take the place of the SA (Sturmabteilung). Through exploiting emotions, religion, and personal favors; Himmler killed those in the party he couldn't defeat with intellect. By the end of the 1920's the SS (Schutzstaffel) achieved everything that Himmler had imagined it would be. The SA were absorbed into the ranks and those who defied the command to fall in line were dead. The SS was a standing army in it's own right. For the nationalistic socialist in Myanmar there is a growing wing of religious zealots that are attempting to recreate the "glory" of the SS in Hitler's Germany. The radicalized organization calling itself Buddhist marches into areas just as the SA did in the 1920's. Like stormtroopers, these so called monks force their brand upon anyone who wants the protection of their saffron robes. This fascist approach to manipulating faith and patriotism brings these monks in line with the Nazi philosophies on governance and population control. All the group needed was a figure head... a vitriolic leader that could manipulate the message and make it palpable to the masses. Hitler fed the SS the hatred they needed to stay in the field and fight. Himmler gave them the directions on how to fight. In Burma the terrorist organization 969 is run from behind the scenes by cowards who dare not show their faces in the light of day. The man who feeds 969 with the hatred it needs to fuel the attacks (several occurring right now) that the group carries out is the less than honorable, Wirathu. This man willingly calls himself the "bin-Laden of Burma". And at no point has Wirathu backed away from the chance to spread this hate speech. From the moment that Wirathu was released from jail in 2010 (falsely labeled as a "political prisoner") he quickly reintegrated into the movement he helped give birth to. From that point on Wirathu's "sermons" became nonstop hate. 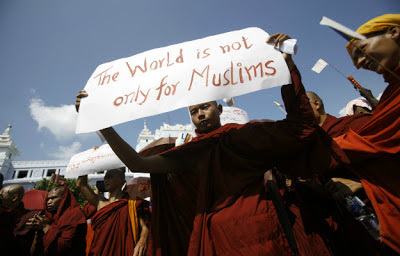 With each rally (reminiscent of Nuremberg) Wirathu's hatred for Islam and the Rohingya has grown more pronounced. In his recent Time Magazine interview Wirathu didn't even bother to hide his hatred for Muslims even in the presence a foreign audience. This hate filled rhetoric was the fuel that created the Rohingya pogroms of 2012 and the current ones still taking place. It is through the constant stream of hatred from Wirathu's speeches that the 969 stormtroopers are capable of sustaining their campaigns across western Burma. Without the motivation the simplistic views of Wirathu would have died out long ago. For though an idea cannot be killed, every idea has a given lifespan based upon it's own merit. From the very beginning of Himmler's involvement in the SS the plan for a boycott against the Jewish population of Germany had took center stage. Himmler took the idea of a forced boycott to the next level. Encouraging violence against the Jews, Himmler organized SS units to join in the displays of antisemitism. And just as anyone could have guessed, the paramilitary organization brought all their hate and rage in one fiery night of total terror. 969 has been organizing boycotts of Muslim owned businesses and merchants all across western Myanmar. For the past three years these boycotts have been spreading as the hate group forces it's way into village after village. And just as anyone could have guessed, where ever Wirathu orders his paramilitary style fascist violence and total terror soon follows. November 9th, 1938 was the start of a nationwide pogrom. It was an attempt by the Nazis to internalize their hatred for the Jews and the Roma in the hearts of German people. The violence was immense and the hostile takeover of Jewish shops and Roma camps was almost absolute. Nearly all Himmler's intentions were carried out to completion. Wirathu's boycotts were planned to spread hatred. In villages where Rakhine Buddhists and Rohingya Muslims had lived in peace for years the 969 extremists plant the seeds of hatred. Tearing apart the fabric of society in the Arakan, Wirathu creates a divide that cannot be passed as long as the 969 boycotts remain in place. For Meiktila this divide would be a fiery recreation of Himmler's intentions for the Jews of Germany. Targeting all Muslim minorities (not just Rohingya) the 969 boycott in Meiktila turned to violence as an argument in a gold shop spiraled out of control. By the time it was over the Muslim neighborhoods were torched and the number of Muslim IDPs increased. And yet Wirathu claimed immediately afterward that 969 is peaceful. “You can be full of kindness and love, but you cannot sleep next to a mad dog." In many of Wirathu's sermons he has expressed a desire to create a religiously pure Myanmar. He has expressed the desire to push all Muslims out of Western Burma while also reducing the presence of other religious minorities (including Christians). The hate group has shown full compliance with his radical visions of Burma's future. And with the backing of politicians such as Thein Sein this vision of Burma has every opportunity for success. If 969's goals are to be achieved the violent expulsion of Rohingya and Kaman must be completed. This was expressed by the acting president Thein Sein last year and backed by Wirathu immediately. So one can only imagine what the government of Burma would have done had a "third country" had been willing to take Myanmar's "undesirables". Then when you look at the next targets on 969's laundry list of "undesirables" you only have to look at Thein Sein's record on dealing with them. Looking east into the Kachin region and the Karen state you can see how trustworthy the "civilian" government (Thein Sein being ex-military) is when dealing with the ethnic minorities. This version of national socialism is a replay of Germany's trip down the same road. With Thein Sein in charge one can only imagine what the future of Burma will be like. This is only more complicated by the relationship between government and hate groups like 969. If the incestuous relationship between hate mongers and politicians is not broken in Myanmar the Nazi final solution is not beyond the realm of reality. When Will It Be "Never Again"
Do You Talk Like A Racist?